In Exchange Server 2007 the Get-ExchangeCertificate cmdlet only allowed us to view the local server's certificates. But in Exchange Server 2010 Get-ExchangeCertificate has a -Server parameter that allows us to view certificates on remote servers as well. 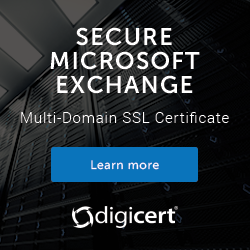 This means we can run a PowerShell script to collect information about the SSL certificates on all of our Exchange servers, which is useful during Exchange 2013 migration planning. This script, Get-ExchangeCertificateReport.ps1, is executed from the Exchange Management Shell and produces a HTML report in the same folder where the script is run from. This script can be downloaded from the TechNet Script Gallery or Github. Feedback and questions are welcome in the comments below. Good catch, thank you. Have uploaded fix (same download link above). Hi everyone, sorry about the 404 errors. Some time in the last few days the download system has broken. I’ve replaced the link now with one that should work. Please let me know if you continue to have download problems. Ok was able to download and test it, however powershell gives an errmsg not correct exchange version, however the report is generated. are there any pre-requisites ? download problem for the latency mail script. Which version of Exchange are you running? I ran the script CertificateReport.ps1 but it did not give me the output at all. What did i do wroong. Please replied. Which version of Exchange do you have? How did you run it? -I running from desktop right now and planing to automate. Which version of *Exchange* do you have in that environment. Ok. The script doesn’t load the Exchange management snapin, so you’ll need to make sure you’re running the script in the Exchange Management Shell. What needs to be adjusted to make this work in Exchange 2013? Nothing I’m aware of. It works fine for me on my Exchange 2013 server when I run it in the Exchange Management Shell. new shell and retry the operation. For more information, see the about_Remote_Troubleshooting Help topic. I’m thinking this is something that can be safely ignored. Note – it does seem to drop out and error once it starts to query the Edge servers, but the error referenced in the error above is not the Edge server, it’s the Multi Role CAS/MBX server. If it was the Edge server referenced in the error then that would make sense. Maybe its because I am running the script from EXCHANGE01 and that is why its referenced in the error? I’ve answered my own question, just ran the script on another Exc 2013 environment I support where they have no Edge servers and did not receive any error, so must’ve been the Edge server causing the previous error as it couldn’t query it. Just an FYI for anyone else who runs into this. Would it be difficult to have an option to sort the report by expiration date, so that the ones expiring soonest would be at the top of the report? I’m futzing with it now, but so far no luck. Thanks for the suggestion. I’ve logged it in my Github repo so I don’t forget, and hopefully I’ll get around to improving the script some time. How do i deploy it for Edge Servers ? Excellent Paul, i have been following your posts since a long time, Honestly, i have learnt Exchange with the help of your Site. Can you Please help us learning O365? CAN YOU PLEASE POST THE LINKS HERE? The script worked like a charm. Thank you, thank you, thank you, thank you, thank you, thank you! And, also, thank you! Your contributions to the community are greatly appreciated. I definitely owe you multiple cold beverages next time we are in the same city.